Getting to know the Art Dept. is the first step to loving us! If you know that your child has an interest in art, then please join us in helping to grow their passion. Night of the Dragon Auction items: Maggie Walker's annual "Night of the Dragon Auction" is held annually. A portion of the auction proceeds will go directly to the Visual Art Boosters (= the Art Dept. and its students) and it's our biggest $ maker. The Auction Committee is looking for interesting and unique items to auction off... Big sellers include: experiences (football game tickets, etc), specialty dinners/events (like our Surrealist dessert and parlor game party! ), trips, or vacation homes (beach condos you are willing to share for a week, etc) . The deadline to submit items is in January. If you have a donation of the kind listed above or are willing to brainstorm/host/help with an experience, please let any of the arts teachers know or just contact with our VAB auction chair directly! PARENTS OF FRESHMEN: First, donate to the VAB and then come to some meetings to get to know the group and to get a feel for how you can help. Take on a "leading role" as a committee chair or play the "supporting character" role as a member of a committee. Still not sure? Consider working behind the scenes to send out invitations, update the website, and/or supply refreshments for exhibit openings! PARENTS OF SOPHOMORES: If your child is sticking with art, that's great! This is the year to get a little more involved if you haven't already done so. Renew your VAB donation, review your role from last year, and consider trying something new. Do you know someone who would be an asset to the group? Invite them to join us! PARENTS OF JUNIORS: Of particular need this year is a group of parents to help with preparations for the annual senior exhibit in June. It has become a tradition for the Juniors to help with this event, especially so that they can begin preparing for their own senior show! As you renew your VAB donation, consider reaching out to parents whose children would benefit from them doing the same. PARENTS OF SENIORS: Wow, what a ride. Congratulations!! Your senior artist will still need as much support as they did as a freshman. They will be working very hard to finalize their body of work and to be prepared for the culminating experience of hanging their senior show in June. Thanks in advance for any and all help that you can offer them - and us - as we get them to the finish line! 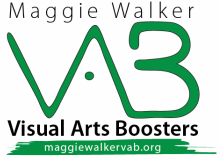 If you've had a good experience with us (as we certainly hope you have), then please share those memories and inspirations with anyone who is considering enrolling at Maggie Walker - let them know what our art department can offer them!